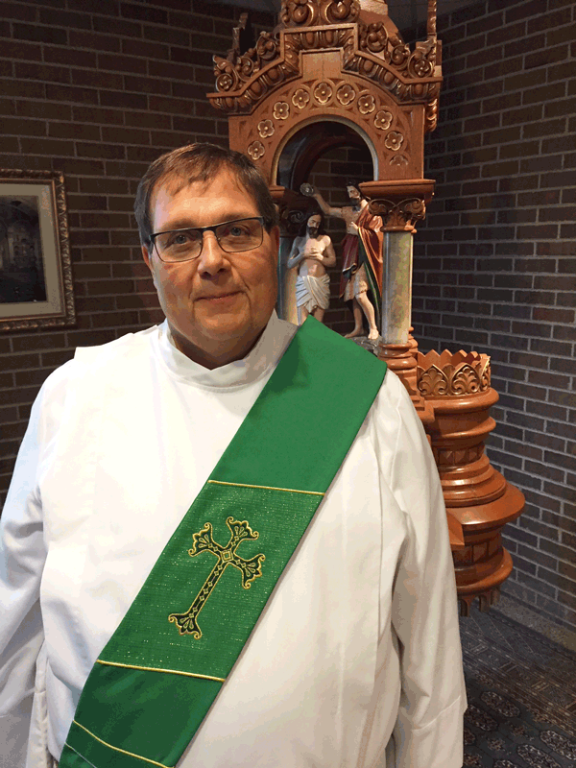 Deacon Joe | St. Joseph Catholic Church, Wauwatosa, Wis.
St. Joseph Congregation is serving as the teaching parish for Deacon Joe Stefancin, who is studying at St. Francis Seminary for priesthood for the Diocese of Superior. He will be with us over the course of the three years. A widower, he is the father of two children. I am originally from the Milwaukee area. I grew up on the south side near St. Patrick’s with my parents, my sister Judy, my brother Andy and my Mom’s mother Grandma Fabry. When I was 5, we moved to West Allis. I went to Holy Assumption Grade School, John Dewey Junior High School before graduating from West Allis Central High School in 1975. I attended several colleges and ended up with a certificate in Printing and Publishing, an associate degree in Commercial Art and a bachelor’s degree in Religious Studies for Further Ministry with certification in Youth Ministry. I served as a director of religious education and as youth minster with the Archdiocese of Milwaukee, St. Cloud Diocese in Minn., and the Superior Diocese. I really like living up north and serving the rural communities of northern Wisconsin. I was married on Oct. 10, 1987. My wife Audrey and I adopted two children, both were great walks of faith. We have one son Joey (26) and a daughter Amanda (18). On Aug. 12, 1995, I was ordained a permanent deacon. Audrey and I moved to Medford on June 1, 1999. It has been our home ever since. In July of 2009, just after our son graduated from high school, Audrey was diagnosed with cancer. She died less than two months later. I thought about priesthood many times throughout my life. I never thought it would ever be possible. About three yrs. ago, I was approached by our diocesan vocation director and our former Bishop, followed by countless other people.